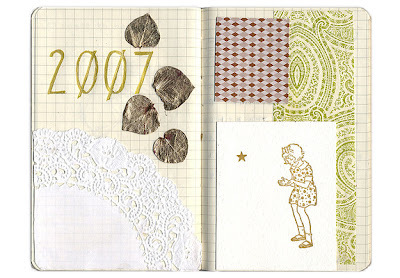 christine castro kept an online journal for about two years, from 1999 - 2001. well before this blogging phenomenon took hold, she chronicled her daily life in a quirky tone, revealing through journal entries precious morsels of her life. christine's confessional manner resonates with me as the lover of memoirs that i am, and as she is also a graphic designer, the site has a distinct eccentric aesthetic to which i also respond. and of course, she also has a shop. i found the above sketchbook image on her flickr page. i never imagined that by browsing flickr's endless supply of imagery for my "a flickr a day" that flickr would turn into my prinicpal source of posting material. but, oh, what wonders i've found simply by responding to an attraction to a tiny thumbnail image.